Bill Peacock (right), shown with Spinal Life Australia Chief Advisor – Government John Mayo, wants to raise awareness of the late effects of polio in the lead up to World Polio Day. With polio set to be eradicated worldwide within the next two years, survivor Bill Peacock says it’s important to remember those who survived and those who are still affected. With World Polio Day being commemorated world-wide on 24 October, the Bribie Island resident and Spinal Life Australia member said thousands of Australians are still feeling the effects of the once-widespread disease. “I had polio when I was just four-and-a-half years old and spent the next seven years in hospital, with several months spent in an iron lung,” Mr Peacock said. While polio is an after-thought for many Australians, Mr Peacock said it wasn’t very well known that a large proportion of survivors can still feel the effects of polio decades after their rehabilitation. “Things were fine until 1998 when I had a major collapse that left me in a wheelchair,” he said. 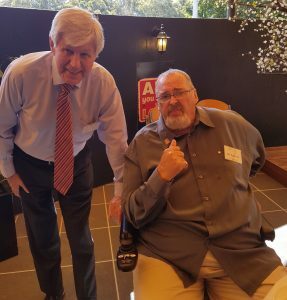 As the facilitator of Spinal Life’s Bribie Island Member Network, Mr Peacock has dedicated his time to raising awareness of post-polio syndrome in his local community and beyond. “We’ve made some great in-roads to ensure Bribie Island and its surrounds are as inclusive and accessible as possible,” Mr Peacock said. “We’ve been blessed with wonderful support from community members and politicians. “That said, we still have some way to go, especially when it comes to raising awareness within the medical community. “There used to be a very big stigma around polio but thankfully that has greatly decreased over the years. World Polio Day was established by Rotary International to commemorate the birth of Jonas Salk, one of the first developers of a successful polio vaccine. Spinal Life Australia supports people with the late effects of polio and hosts member networks for survivors to share their experiences and advocate for change in the local community. For more information on post-polio syndrome or to find your nearest support group, visit www.spinal.com.au/postpolio.